Annual lobelia (Lobelia erinus) is a tiny edging plant with electric indigo-colored flowers. Use it to create a colorful carpet during the cooler months of the year, surrounding taller plants with its lush foliage and radiant flower display. Typically growing no more than six inches tall, annual lobelia functions as a small scale groundcover for seasonal flowerbeds. Individual plants will spread to a foot or more across, but are typically planted as groundcover plugs on a six to eight inch spacing, so that they quickly fill in and become a dense carpet. Individual flowers are tiny, but decorate the surface of the foliage for months on end, seeming to float ethereally above the leaves. The leaves are equally tiny, oval in shaped and arranged on thin, filamentous stems. Some cultivars of annual lobelia have bronze-tinged foliage that forms a stunning contrast with the deep blue of the flowers. 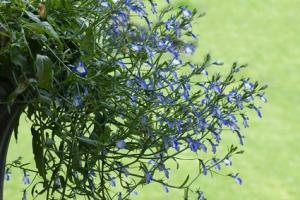 Annual lobelia thrives in cool weather, but is not frost-tolerant. It is best planted in early spring, as soon as the danger of frost has passed. It may suffer a bit during the heat of summer and cease flowering, but once things cool off again it will rebound. The first hard frost of fall marks the end of the growing season for annual lobelia. 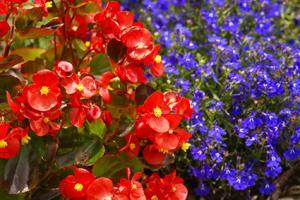 The plant tolerates shade, but flowers better and has more colorful foliage in full sun. That being said, in hot climates it's best to give it afternoon shade or filtered light to prevent it from being scorched. Annual lobelia is at its best in cool coastal climates. A rich, moist bed of loose garden soil is best for lobelia - essentially the same conditions preferred by most other annual bedding plants. It does not tolerate drought, but heavy, waterlogged soil is equally lethal. Amend the planting area thoroughly with compost. 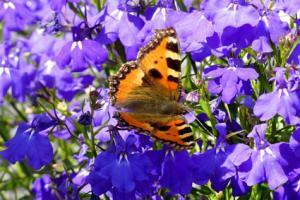 Annual lobelia is an excellent nectar source for butterflies. Plant it as edging along pathways and in the foreground of annual and perennial borders. Use it in potted arrangements to fill the ground plane with its fluffy foliage and colorful blossoms. Annual lobelia will spill gracefully over the edge of garden walls and hanging baskets - two contexts where its elegant form can really shine. Planted alongside a pathway or patio, it will soften the transition between the hardscaping and landscaping. Other than providing a rich growing medium and planting it in the right location, annual lobelia is very easy to grow. Using a slow release fertilizer at planting time is a good way to promote season long flowering and lush growth. Alternatively, it can be fertilized monthly with a dilute solution of all-purpose fertilizer, if desired. Annual lobelia has a shallow root system that dries out easily; it will need water a minimum of once per week, but may require irrigation on a daily basis during heat waves, especially if planted in a pot. One optional bit of maintenance with annual lobelia is to shear the plants midway through the growing season. Using a pair of scissors, simply trim it back to about 50 percent of its height in late summer when flowering has petered out. It will grow back immediately and look extra sharp through the fall. Pests aren't really an issue with annual lobelia. Disease is uncommon as well, but the plants may show signs of root rot (e.g., wilting) if the soil is too heavy and wet. There is no point in trying to remedy this directly, as it's just a matter of creating the proper growing conditions. 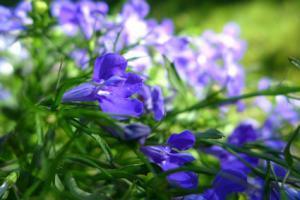 Annual lobelia comes in several different colors other than the standard purplish-blue. 'Cambridge Blue' has light blue flowers. 'Paper Moon' has white flowers. 'Rosamunde' has red flowers with a white center. 'Sapphire' has purple flowers with a white center. 'Blue Cascade' is one of the best cultivars for trailing over a wall or a hanging basket. 'Crystal Palace' has deep blue flowers and bronze foliage. 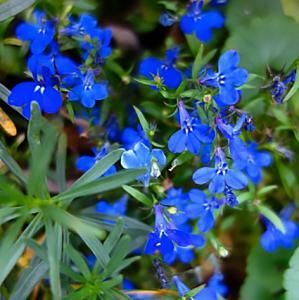 It's hard to imagine a richer shade of blue than the color of annual lobelia flowers. As an easy way to fill empty space in flower beds, it's a miniature groundcover with a lot of possibilities to beautify the landscape.